Uh, we're not bragging. We're sure you were doing something cool, too. But we DID get a gold record with our name printed on it. 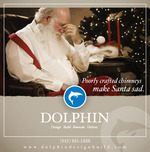 After everything he's done for you, why would you want to make Santa Sad? On a serious note, we'd like to thank our clients who inspire us to do award-winning work. You guys rock! The Advertising Federation of Charleston's 2010 ADDY® Awards show was held at the Memminger Auditorium Saturday, February 6, and featured a rock n' roll theme. This show was the first step in a 3-tiered competition. SLANT will now advance to the regional competition. Regional winners will advance to the final tier, the national ADDY competition. SLANT won a National Gold Addy® in 2004 for its own website. The American Advertising Federation says "The ADDY® Awards represent the true spirit of creative excellence by recognizing all forms of advertising from media of all types, creative by all sizes and entrants of all levels from anywhere in the world." We know you've been wondering about how we fared at the American Advertising Federation' regional ADDY awards. Well, we brought home the Silver ADDY for our SLANTdemo.09 video reel in the “Self- Promotion, Broadcast” category for AAF's District Three, which featured creative submissions from South Carolina, North Carolina and Virginia. The three stages of competition in the annual ADDY Awards are local, regional and national, and we're on to the final stage! SLANT's demo reel will now advance to compete at the national AAF ADDY Awards on June 12, 2010. Woohooo! View the SLANTdemo.09 video in all its HD glory here. Thanks for the coverage on SLANT's Regional Silver ADDY from the Charleston City Paper, the Charleston Digital Corridor, The Digitel, and the Charleston Regional Business Journal!